Endowed with a rich, widespread end-use landscape, carboxymethyl cellulose (CMC) market has been traversing alongside a highly lucrative growth path since the last few decades. An anionic water-soluble polymer, the uses of carboxymethyl cellulose as a stabilizer, emulsifier, and thickener are rather renown, pertaining to its non-toxicity, water solubility, high swelling, and hypoallergenic properties. In the current industrial scenario, the food, pharmaceutical, paper manufacturing, and oil & gas sectors have been finding the product to be highly indispensable. This in consequence, has led core carboxymethyl cellulose manufacturers to expand their product portfolio via numerous growth tactics. Recently in 2017, the renowned carboxymethyl cellulose manufacturer, Cargill, declared an investment of USD 240 million in India’s food processing industry. The company’s decision to pour in money on the nation’s developing F&B sector is a sure-shot indicator that the regional CMC market would receive a commendable boost. Certain other companies have been focusing on strengthening their stance in the application markets as well, in a bid to stand in line with core CMC manufacturers. Symrise for instance, recently opened an innovation center in Singapore to strengthen its position across Asia food and nutrition industry. Since the last few years, pharmacists have shifted their focus toward compounding medicines for providing effective and safe medical treatments, specifically to patients suffering from dermatological diseases. Incidentally, selected CMC polymers are extensively used for drug delivery formulations owing to the product’s drug release and swelling capability. In accordance, many skincare product manufacturers prefer to use CMC compounds for developing a new range of dermatology products. In this regard, they have been adopting new technologies for developing high quality and effective skin care product ranges, which will turn out to be commendable revenue-generating grounds for the players in carboxymethyl cellulose industry. As on today, the launch of new medicines in the market has decreased considerably owing to the failure rate of clinical trials. In response, drug manufacturers seem to have adopted new strategies to develop advanced medicines that are incidentally, already being used in healthcare. This strategy may help reduce the risk of unexpected adverse impact of newly developed medicines on human health, since these ones have already been characterized. Speaking of the fact, many pharmaceutical companies have considerably developed CMC based eye drops, which will act as a lubricant. In case of burning eyes and discomfort due to exposure to sun and wind, CMC based eye drops are prominently being used as temporary relieving agent. CMC is commonly used as a viscosity modifier as well as an emulsion stabilizer in several products across the F&B sector. Due to the product’s incredible advantages, many food manufacturers are observed to be adding carboxymethyl cellulose powder while making ice creams. In addition, CMS finds usage in developing baked goodies such as bread and cakes with lesser fat content. A wide range of carboxymethyl cellulose food grades, incidentally, are used in the manufacturing of peanut butter, chewing gums, margarine, and candies, owing to the product’s texture enhancing and emulsifying nature. The change in preference has been promptly taken note of across numerous geographies and favorable norms seem to have been initiated in support of the same. In India for instance, a few years ago, the Food Safety and Standards Authority of India set a new benchmark for the uses of carboxymethyl cellulose in various food and beverage applications. Post the enforcement of this standard, it had been observed that carboxymethyl cellulose uses in ready-to-serve beverages had increased tremendously. Emulsifiers, since a very long time, have been abundantly used in processed foods to improve food texture, but unfortunately, they have given rise to diabetes and obesity problems, that are on the verge of a constant incline on account of a sedentary lifestyle. However, in order to devise a way in which people could consume processed foods, F&B manufacturers have long since been on the lookout for new, harm-free emulsifiers. The problem has been effectively solved by CMC as the product stabilizes food and replaces the fat content in the same. Quite overtly, CMC manufacturers have been finding the F&B sector to be a prime revenue ground, as food companies have been rapidly using CMC in manufacturing various processed foods. Considering the current scenario in F&B sector across the globe, it has been forecast that carboxymethyl cellulose market from food and beverage applications will register an annual growth rate of more than 4% over 2016-2024. CMC industry boasts of being strictly regulatory driven, owing to the product’s usage in food and medication. Citing an example, a few years before, one of the leading pharmaceutical companies Optinose®, developed an advanced drug delivery component for treating nasal polyps, for which the FDA provided approval in 2017 post five clinical trials with more than 1500 adult patients. The organization found that this newly developed Exhalation Delivery System helped significantly reduce nasal congestion. As per estimates, more than 10 million Americans suffered from nasal polyps in 2017. The incidence proves that the increasing usage of nasal sprays for treating nasal congestion problems will have a major impact on the regional carboxymethyl cellulose industry size, as CMC is one of the prominent contents in a newly developed nasal spray. Encouraged by the FDA’s support for the right products, drug manufacturing companies have been massively involved in research and development activities to enhance the applicability of CMC. Last year for instance, Allergan launched an innovative product for people who suffer from the problem of dry eye. The drug apparently comprised CMC as an active lubricant which provides long-lasting relief to eyes through moisture maintenance. Regulatory organizations have also been stringent about CMC uses in the F&B sector as a food additive and emulsifier. For instance, the U.S. Food and Drug Administration (FDA) has provided official approval to use CMC up to 2% in various foods. In addition, the Food Standards Australia New Zealand has also permitted the use of carboxymethyl cellulose as a food additive. 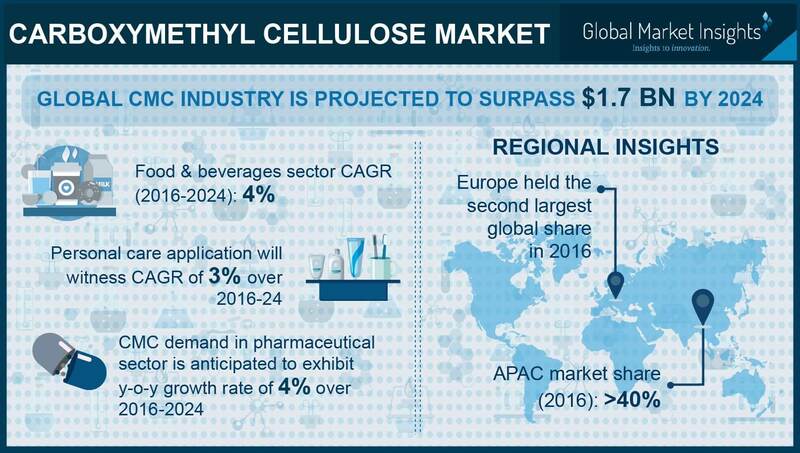 The increasing support from various regulatory bodies across the globe is thus poised to boost carboxymethyl cellulose (CMC) industry trends. Considering the growing demand for CMC across numerous end-use sectors, carboxymethyl cellulose manufacturers are naturally looking forward to developing a highly enhanced range of CMC products. Core CMC manufacturers have been undertaking myriad initiatives on these grounds to extend their reach through capacity expansions and novel product interventions. In the ensuing years, CMC will be used even more extensively across the food & pharma sectors, on account of which CMC industry will be heavily regulatory-driven. Fueled by the product’s highly beneficial properties and its demand across diverse application domains, CMC industry size, as per estimates, has been projected to cross USD 1.7 billion by 2024.